It all began with a rugby game. Englishman Matthew Spacie, who was based in Mumbai working for travel company Cox & Kings, often headed to the Bombay Gymkhana to play the sport with his friends. But amidst all the fast paced action, there was something else Spacie noticed: A group of young boys from a neighbouring slum, which frequently loitered around the area to watch him from outside. One day, he invited the boys to join the game. This became a regular occurrence and, over time, he became their mentor, guiding them in not just the sport but also more personal aspects such as education. Through these boys, Spacie interacted with other disadvantaged children, and grew increasingly passionate to help them towards a better future. So in 1999, he founded Magic Bus, a non-governmental organisation aimed at improving the lives of children from impoverished communities through sports-based activities. This is done through mentorship and employability programmes delivered through volunteers. Young people selected from these communities are also trained and appointed as volunteer Community Youth Leaders — mentors to children in the programme. 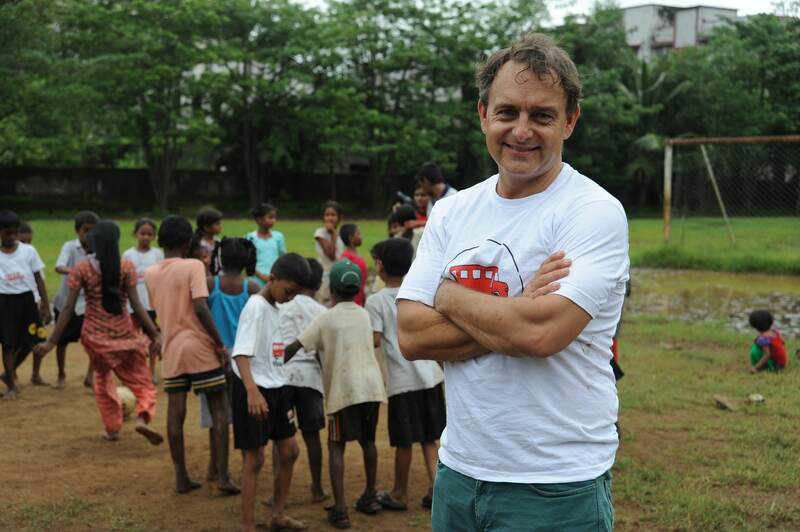 Located in Mumbai, the charity had a humble start with a few volunteers and the 15 boys Spacie had played rugby with. Today, it reaches out to 300,000 children, 8,000 Community Youth Leaders, in over 2000 communities within 22 states across India. It has 28 offices and 17 youth livelihood centres there, as well as overseas offices in the UK, US and Germany. Magic Bus has also made its way here: It has a local office and come May 23, will host a charity event at Capella Singapore in Sentosa. But this 48-year-old, who is married with two young children, is far from done in his journey of helping others. In a nutshell, what is Magic Bus about? Magic Bus is about tackling poverty, and giving children and youth from the most disadvantaged backgrounds control over their lives, so that they have a fair chance to move from marginalisation, engage in society at large and fulfil their ambitions. Tell me about what the organisation was like, in the beginning. When the programme was initiated in 1999, we used to take small groups of children from slums near the Bombay Gymkhana away from the city and to the countryside in a bus, as an escape from their dire living conditions. The children had never seen fields, forests or mountains before so they felt that it was a magical experience and called the bus that transported them the “Magic Bus”. Our programme has since evolved to become community-based but the name Magic Bus has stuck — it connects us to our dreams of those early days. How does Magic Bus’s curriculum work? Our academic curriculum has been researched and developed with the help of education specialists. It is based on experiential learning theory where sessions are structured in such a way that children and youth learn through action and reflection. Each lesson involves an activity with a message behind it that addresses real-life issues which keep people living in poverty, within the domains of education, health, gender and livelihood. Children and youth are also sensitised to their rights in these key domains, for example, their Right to Education. The curriculum is effective because the technique used to teach children and keep them engaged is experiential, fun and engaging — it captures their attention and maintains their interest over a sustained period of time. How does mentorship come into the picture? The Community Youth Leaders we recruit and train to deliver the curriculum on the ground, are from the same communities as the children. Since they live in the same conditions as the target population, they understand their needs and engage better with them, leading to a stronger mentor-child relationship. The curriculum also includes engagement with parents and the community at large because without their support, the programme cannot be successful. What makes sport such an effective tool in helping a child break out of the poverty cycle? Sport is a powerful tool because it acts as a magnet attracting children and youth and keeping them engaged in the programme. Through sport and activity-based learning, children develop confidence, as well as team work, leadership and other core skills and habits that equip them to move out of poverty. These are vital inputs that they would not otherwise be exposed to in traditional classroom teaching. On the playing field where sessions take place, barriers relating to gender, religion and class are dissolved and everyone operates on an equal level. This creates the best environment for an impactful engagement to take shape. Before focusing on Magic Bus full-time, you were working as the Chief Operating Officer of travel company Cox & Kings. How difficult was it to leave your stable job? The choice to leave wasn’t difficult because I thought I would lead the organisation for a limited time. Only once I started did I realise this was a big job but with lots of potential. More than the 90% reduction in salary, I think what I found most difficult was persuading people to support our initiative, because our programme works on behavioural change, we don’t ‘build schools and hospitals’. What’s next for Magic Bus? We are globalising, and in the next five years we will be programming in about a dozen countries. Moving more children out of poverty across the world is exciting. We are also making the programme technology-enabled this year with the view that soon across all our programmes we can connect our donor base directly with our participants through basic 3G networks. Lastly, we are building the largest youth development and livelihood programme in the country. Sign up for our newsletter to have the best news and reviews from Prestige Online delivered straight to your inbox. Magic Bus' founder Matthew Spacie. Sign up for our newsletter to receive the latest on the city's top personalities and coverage at exclusive events.